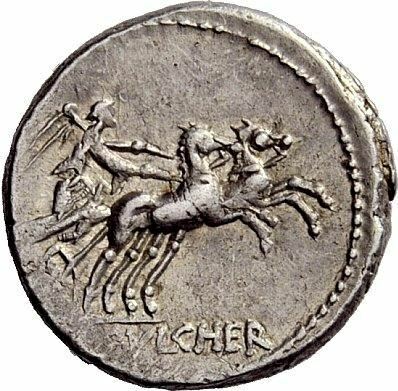 Caius Claudius Pulcher was one of the moneyers for the year 110-109 BC. He later served as Consul in 92 BC. In 100 BC he was one of those took up arms against Saturninus. In 99 BC he was curule aedile, and in the games celebrated by him elephants were for the first time exhibited in the circus, and painting employed in the scenic decorations. In 85 BC he was praetor in Sicily, and, by direction of the senate, gave laws to the Halesini respecting the appointment of their senate. Cicero speaks of him as a man possessed of great power and some ability as an orator.